Burano, also known as the lace island, is an island in the northern Venetian lagoon. Burano is extremely famous for its brightly colored houses, those square-shaped houses of a riot of colors along the water channels make it like a fairy tale land. 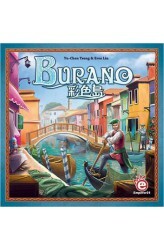 Fishing has been the main activity in Burano since its foundation. A story goes that while fishermen went a long-term fishing outside the lagoon, their wife who stayed and missed their husband took out needles and made lace like they mended their husband's fishing nets. In the Middle Ages, Burano lace was highly admired and widely requested by royal families all over Europe. Players represent a family leader on this little island. They can send men to fish for the main source of income, or send women to lacemaking to sale abroad. Maki..
gure of the early Meiji Restoration who lived a turbulent life. The saying means, "When a crow cries, I must leave this place. Even if I must kill crows all over the world, I want to stay with you a little while longer." The song expresses his longing for amorous time to be prolonged for even just a short while. 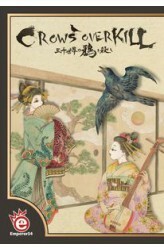 In the game Sanzen Sekai: I'd kill all the crows in the world to be with you a little longer, now titled Crows Overkill in its newest edition, players roleplay guests in a red-light district. Many birds.. Welcome to the most well-known geisha street in the old capital, Hanamikoji. Geisha — the graceful women elegantly mastering in art, music, dance, and a variety of artistic performances after years of training — are greatly respected and adored. Geisha may be translated to "artist" and they dance, sing and entertain everyone. 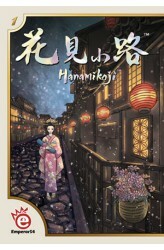 In Hanamikoji, two players compete to earn the favors of the seven geisha masters by collecting the performance items with which they excel. With careful speculation and sometimes a few bold moves, you may earn the essential items by giving away the less critical ones. Can you outsmart your opponent and win the most favors of the geisha? 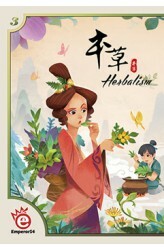 https://www.youtube.com/watch?v=eDeTHL_RDpQ ..
Cang Jie is one of the legendary figures in ancient China. As legends foretold, he was inspired by the footprints of animals on the ground, and began to create all kinds of different symbols according to the forms of all things in nature, hoping to replace the conventional, yet unreliable, knot tying way of remembering things. For conveniences, Jie decides to name these symbols "Zi", which means "character". This is the origin of "Hanzi", the "character from Han dynasty". 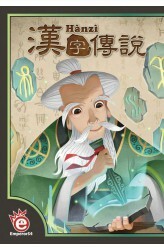 In Hànzì, players travel back 3600 years and serve as one of the pupils of Master Cang Jie. As you learn from the Master, you will create new characters that serve as the foundation of modern Chinese culture. In game terms, you lay out double-sided cards on the table that show the old letters on one side a.. In the game Herbalism, players take on the role of a group of novice pharmacists, hoping to find the cure to the pandemic that is currently plaguing the country. Players must exchange information with one another in order to gain more insight into the ingredients of the cure; however, only one can earn the title of "God Farmer," so be careful not to share all of your knowledge too easily! https://www.youtube.com/watch?v=E14EfuBdIzM .. Mysterious and intriguing temples call for exploration by brave adventurers. Powerful arcane runes were hidden in these ancient magical ruins protected by dark and deadly curses. 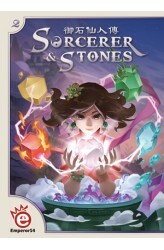 Only the most courageous and adventurous Curse Breakers may enter the temples, break the dark curses, and bring back the arcane runes for the magic academy for its glorious bounty. Through teleportation, you can collect crystals of various colors from all over the world, and put them on your very own Crystal Grid in the correct order. Only then will the power of the crystals fuse together, and be powerful enough to break the dark curses inside the temples. Are you able to rise among your peers, and become the most reliable and professional Curse Breaker the magic academy has ever seen? In Mystery of th.. The round houses (a.k.a., Fujian Tulou) are unique rural dwellings that can be found in the mountain areas in southeastern Fujian, China, dating back to the Ming dynasty (17th century). A round house is a large, multi-floor, enclosed, and fortified earth building housing usually a whole clan, which functions as a village and is known as "a little kingdom for the family". 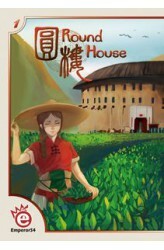 In the game Round House, players are the head of a family who tries to lead their members to glory. Players take turns moving their pawns around the circular building in one direction, performing different actions to get goods, trade goods for money, hire experts, send family members for distant business, and eventually bring the families home to worship the ancestors. 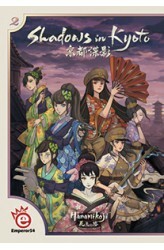 By cleverly moving your pawns around the r..
Shadows in Kyoto is a two-player abstract game based with the background of Hanamikoji in which players take control of the Oniwaban, a group of undercover spies, secretly protecting the Shogun, or an intelligence agency of the Meiji Government, funding with the advanced technology of the Western Industrial Revolution. As the commanders, the players must secretly gather key intelligence from the opponent while protecting their own interests. Through movements, conflicts, and tactics, players have three different paths to victory: 1). Capture 2 enemy agents who possess real intelligence. 2). Let your opponent captures 3 agents of your own who possess fake intelligence. 3). Succeed in the escape of 1 agent of your own who possesses real intelligence. https://w..
"Xian" e.g https://en.wikipedia.org/wiki/Xian_(Taoism) , or the "godly spirit," is the final form that a human can become through the act of training and enlightenment. A Xian is practically immortal, and possesses godly powers. During the early Qin Dynasty, many Taoists are obsessed with the idea of Xian, and study the act of Xian intensely, looking for all possible ways to increase their chance of enlightenment. Many fascinating legends are the results of such obsessions. 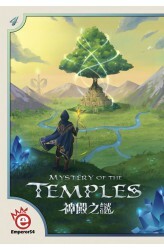 During the game, players will travel back to the ancient kingdom, and attempt to attain enlightenment by controlling spiritual stones and "Qi," the life energy. By studying under Taoism, players will race to see who can rise among their peers, and be the first one to become a Xian and achieve immort..